With the alarming rate of advances in technology and affordability, a New Wave of Hackers has reached the shores of the infosec world. And the preferred choice of platform for these next generation hackers? The Mobile Platform is ideal since modern phones are easily concealable and heavily spec’ed, allowing resource-intensive applications to run. With the commonness of Free WiFi, people are quick to accept a False sense of security and make it a part of their everyday life. It isn’t rare to walk into a cafe and see many users updating their social media, checking their finances, or responding to corporate emails; unknowing that their sensitive information can be viewed by criminals easily. How are these Attacks Executed? 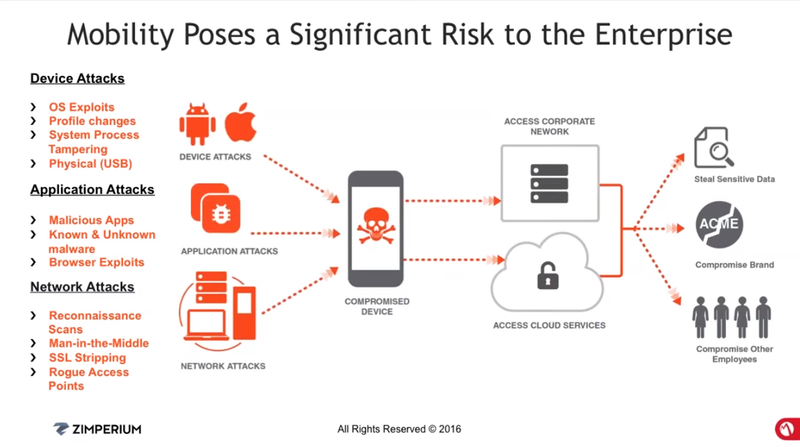 View this webinar by Zimperium, the leading innovator in Mobile Threat Protection, as they talk about the latest trends in Mobile Security, and how to remain Secure. Mobile devices, with the right tools, can be a Massive Arsenal to aid in both securing and defending against the New Threat. Mobile devices, just like the internet, were designed for ease of usability first, and security was added later when it was too late. Even with the massive amount of media attention on security, financial reasoning trumps security.